Find us in the lobby of the Millennium Library at Donald & Graham. See Flyer. 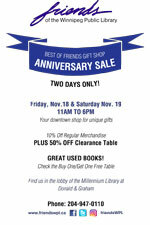 To all our Book Sale Fans who are asking “When? !” There has been a delay in getting our Permit from the Winnipeg School Division to use Grant Park High School Gym for the sale. But stay tuned – we hope to announce it very soon. Consider donating your gently used books, CDs, DVDs & LPs for our fall book sale. Label the bags or small sturdy boxes “FRIENDS” and take them to any branch of Winnipeg Public Library. If needed, we can pick up larger donations, which must be packed in smaller, sturdy boxes. Leave a message at (204) 488-3217 or email to info@friendswpl.ca. BOOKS & BRUNCH 2016 was another winner. The sunny blue sky and warm temperature was a perfect backdrop to The Gates’ setting on May 1st for the 11th annual BOOKS & BRUNCH. A capacity crowd enjoyed the superb buffet as well as the Rainbow Auction (our best yet – over $2,000 in prizes!) The highlights of course were our “Books I Have Known and Loved” speakers, Lara Rae and Catherine Hunter They hit both literary and entertainment notes, and had the crowd enthralled. Ben McPhee-Sigurdson was once again our charming MC. We were pleased to acknowledge Manager of Library Services Rick Walker in the crowd, which sparked a nice round of applause for him. We closed the day thanking Ray Louie of The Gates on Roblin, and setting the next B&B date: Sunday, May 7th, 2017. Another Great Books and Brunch! On May 1, 2016 at The Gates on Roblin an enthusiastic audience enjoyed wonderful weather, a super silent auction, great food, and entertaining recollections of “Books I Have Loved 2016” by guest speakers Lara Rae and Catherine Hunter. Mark your calendars now for next year’s event on May 7, 2017! Kathy Blight (wonder woman) has just announced that The Gates on Roblin have found a couple of extra tables for us – YAY! So if you thought we were sold-out for Books & Brunch and you hadn’t bought a ticket, this is good news!